Discussion in 'Article Discussion' started by Gareth Halfacree, 8 Apr 2014. Got this driver installed but not had a chance to test it out yet. Will be interesting to see if the drivers can help smooth out Battlefield 4 abit. Bah! I'm still blaming the new keyboard. Fixed, ta! Would have thought a few benchmarks form Bit-Tech might have been appropriate? 1) My newest, and only, Nvidia graphics card is a GeForce 9800GT. B) I don't have any of the games that Bit or Nvidia uses for benchmarking. iii) I also don't have any boxes running Windows, which means DirectX is a no-go. But if you ever want to know how the AMD A10-5800K APU holds up in glxgears, just holler! 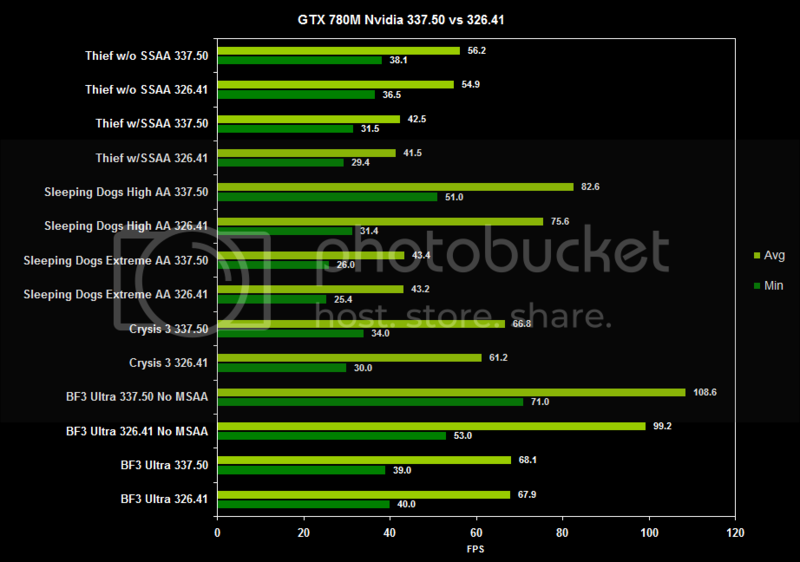 Nvidia, regardless all the bashing that has received, has made a fantastic job over the last 5 months. Between November to March (previous driver), they gave more than 10% boost to both the 780s. See the Gigabyte 780 Ghz edition, using the latest drivers from the review last few weeks, compared to the PNY 780 XLR8 OC (similar clocks) back in November. Compare also how the 780 performed against the reference 290 back then, and how it performs today against the 290 Tri-X OC ones. However still that game murders my GTX780@1293, and considering to upgrade to a 780Ti 6GB when they come out. A free performance increase is always welcome but this isn't particularly exciting. Where Mantle improves performance on lower end hardware the most this seems the opposite way around. I mean a 50% increase in Sniper Elite using an i7 and two 780ti in SLi! That probably gets well over 150fps anyway so and increase is immaterial. If they can get a 20% increase with a GT640 then I'd be impressed. Never saw too many biased benches on anandtech in truth. They use a pretty up to date test setup and use the latest games which are slightly more relivent than bit techs out dated tests in places. As for whatever this does we shall see. Mantle is most effiecent on low end cpus I dout this can say the same thing. But the low end cpu bit is not that relivent to 90% of the readers of anandtech or bit tech in truth. If you have a big cpu high end fx 8300 + or i7920 + the differences shown in benches using mantle are very small gains 5-10% here and there. Using a low end i3 and low end fx the differences can be as large as 50% in some titles. Take 2 of the older cards the 7970 and the 680 the performance difference between launch and now is like basically 2 different cards thats a performance boost if there ever was one. Mantle and whatever Microsoft and Nvidia make are not really doing alot that drivers have not done in the passed. Till you see a game coded for either from the ground up it could be a long wait to see which really works out as better. Thief and BF4 show what mantle can do when clogged on to a already fully completed game the end results on high end hardware are very small gains if any. If we get a game that is made for Mantle as Mirrors edge 2 might be you might finally see its benefits to gamers. I'll see if we can run a few quick tests soon though, but I'm not expecting much as the settings we use, even at 1080p are GPU limited (by design). We may also be reworking our GPU test procedure soon, in which case I'll just wait until then. That's the big question, I believe DICE said BF4's development process took no account of Mantle since Mantle came much later. As High end rigs currently see little gains, that 'freed up' performance clearly isn't being utilised. Of course, proprietary solutions are far from ideal, with a game crapping out on [say] Nvidia GPUs and vice-versa. As there are the same concerns about Nvidia's GameWorks optimisations in UE4. DX12 may solve this 'low level' optimisation problem for both Nvidia and AMD. Allowing Studios to optimise without proprietary concerns and concerns about scaling to low-end rigs. The vast majority now having DX11 cards: http://store.steampowered.com/hwsurvey. Still has the black screen driver recovery error in Planetside 2 though. Lately I've been playing around with my hex core system. I was actually taken aback by the gaming performance it has tbh. I mean, I know that I've been running it at pretty low resolutions (1400x900 and now 1280x1024) but the figures I've seen have really surprised me. For example BF4 sat jammed in the high 40s completely maxed out. I've overclocked the GPU (GTX 480 Lightning) but yeah, very pleasantly surprised. With a 1.7ghz CPU I expected a slide show but recent titles seem to suffer no ills. I think as gaming progresses more and more the CPU is going to be pretty much eliminated from the equation. This is good, because CPUs have been holding back GPUs for too long IMO. Some reasonable gains to be had as long as you aren't completely GPU bottlenecked. I tried it out on my 680. After several benchmark runs in Unigine Valley the new driver consistently delivered a better score - a huge 0.1% increase. Seriously? The comments section of the AnandTech review of the 295X are claiming the exact opposite, that AMD paid them off for a favourable review. Both claims are utter ******** - if you read through their articles in detail, they focus very heavily on technical details, testing methodology and the results (rather much in the way that a scientist or engineer would, because many of them actually are scientists and engineers). They really have no biases or leanings towards any particular company. This sounds interesting. Any idea what effect this driver will have on older systems, such as those running a 580 GTX with a C2Q at 4GHz? I'll be very surprised if it has any effect on a 580GTX. Nvidia stopped optimising drivers for the 500 series roughly 20 minutes after the 600 series was released.